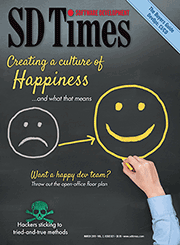 The SD Times 100 is about innovation and leadership. While every project and organization in the SD Times 100 list meets those criteria, there are a few that, through the work they accomplished in 2011, were able to shift an entire industry toward a platform, methodology, emerging standard or even way of thinking. This list includes many of the major players in the software industry, as one would expect, as well as some perhaps surprising newcomers.